This unbelievable piece is so unique and so elegant. When you wear it you will feel so special. Wrapped in 14k gold filled swirls the focal is a gorgeous piece of handmade dichroic glass which is burgundy with flecks of gold in it. You'll love the way this sparkles the neck part is made of amethyst crystals and gold crystals and embelished with little four leaf clover design connectors. 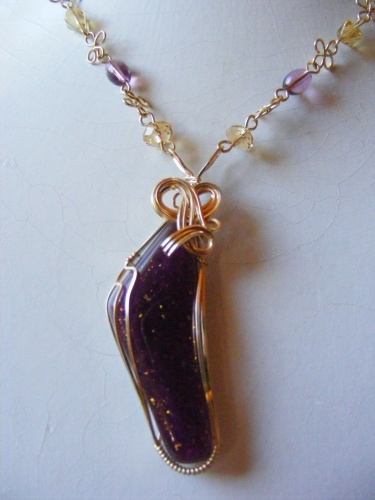 Has a 14k gold filled lobster claw clasp and measures 17" in length. I love this piece I know you will too.